A loutrophoros (Ancient Greek: λουτροφόρος; Greek etymology: λουτρόν/loutron and φέρω/pherō, English translation: "bathwater" and "carry") is a distinctive type of Greek pottery vessel characterized by an elongated neck with two handles. The loutrophoros was used to carry water for a bride's pre-nuptial ritual bath, and in funeral rituals, and was placed in the tombs of the unmarried. The loutrophoros itself is a motif for Greek tombstones, either as a relief (for instance, the lekythos on the Stele of Panaetius) or as a stone vessel. There are many in the funeral area at the Kerameikon in Athens, some of which are now preserved in the National Archaeological Museum of Athens. Richter, Gisela M. A. 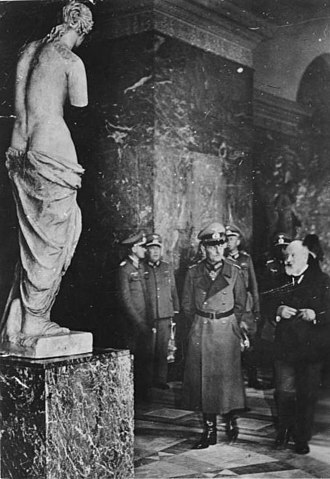 (1928). A Newly Acquired Loutrophoros. The Metropolitan Museum of Art Bulletin, Vol. 23, No. 2, Part 1, pp. 54–57. Wikimedia Commons has media related to Loutrophoroi. 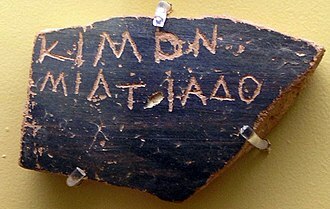 This article relating to archaeology in Greece is a stub. You can help Wikipedia by expanding it. Ancient Greek funerary practices are attested widely in the literature, the archaeological record, and the art of ancient Greece. Finds associated with burials are an important source for ancient Greek culture, the Greeks knew about how to bury their dead. The body of the deceased was prepared to lie in state, followed by a procession to the resting place and ritual laments are depicted on burial chests from Tanagra. Grave goods such as jewelry and vessels were arranged around the body on the floor of the tomb, graveside rituals probably included libations and a meal, since food and broken cups are found at tombs. A tomb at Marathon contained the remains of horses that may have been sacrificed at the site after drawing the funeral cart there, the Mycenaeans seems to have practiced secondary burial, when the deceased and associated grave goods were rearranged in the tomb to make room for new burials. 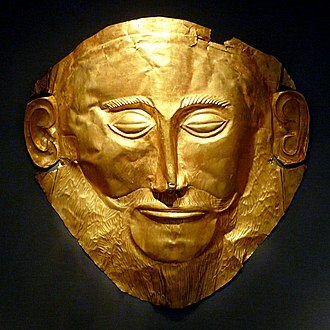 Until about 1100 BC, group burials in chamber tombs predominated among Bronze Age Greeks, Mycenaean cemeteries were located near population centers, with single graves for people of modest means and chamber tombs for elite families. The tholos is characteristic of Mycenaean elite tomb construction, the royal burials uncovered by Heinrich Schliemann in 1874 remain the most famous of the Mycenaean tombs. An exemplary stele depicting a man driving a chariot suggests the esteem in which physical prowess was held in this culture, Greeks thought of the Mycenaean period as an age of heroes, as represented in the Homeric epics. Greek hero cult centered on tombs, after 1100 BC, Greeks began to bury their dead in individual graves rather than group tombs. Athens, was an exception, the Athenians normally cremated their dead. During the early Archaic period, Greek cemeteries became larger, and this greater simplicity in burial coincided with the rise of democracy and the egalitarian military of the hoplite phalanx, and became pronounced during the early Classical period. A dying person might prepare by arranging future care for the children, many funerary steles show the deceased, usually sitting or sometimes standing, clasping the hand of a standing survivor, often the spouse. In the material culture of classical antiquity, a phiale or patera is a shallow ceramic or metal libation bowl. It often has an indentation in the center underside to facilitate holding it. It typically has no handles, and no feet, although the two terms may be used interchangeably, particularly in the context of Etruscan culture, phiale is more common in reference to Greek forms, and patera in a Roman setting. Libation was a central and vital aspect of ancient Greek religion and it is one of the basic religious acts that define piety in ancient Greece, dating back to the Bronze Age and even prehistoric Greece. Libations were a part of life, and the pious might perform them every day in the morning and evening. A libation most often consisted of mixed wine and water, but could be unmixed wine, oil, the form of libation called spondē is typically the ritualized pouring of wine from a jug or bowl held in the hand. 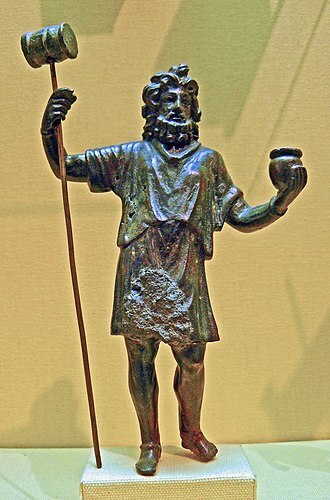 The most common ritual was to pour the liquid from an oinochoē into a phiale, the Greeks stood when they prayed, either with their arms uplifted, or in the act of libation with the right arm extended to hold the phiale. In the pottery of ancient Greece, a kylix is the most common type of wine-drinking cup. It has a broad, relatively shallow, body raised on a stem from a foot, the main alternative wine-cup shape was the kantharos, with a narrower and deeper cup and high vertical handles. As the representations would be covered with wine, the scenes would only be revealed in stages as the wine was drained and they were often designed with this in mind, with scenes created so that they would surprise or titillate the drinker as they were revealed. The word comes from the Greek kylix cup, which is cognate with Latin calix, the term seems to have been rather more generally used in ancient Greece. Individual examples and the many named sub-varieties of kylix are often called names just using cup, like all other types of Greek pottery vessels, they are covered by the general term of vase. 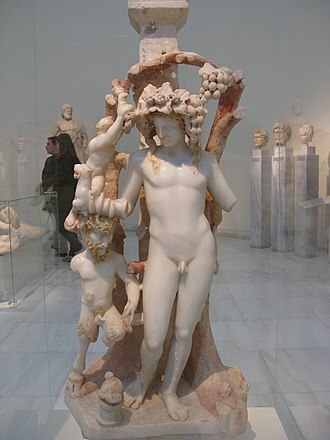 Dionysos, the god of wine, and his satyrs or related komastic scenes, are common subjects, on the external surface sometimes, large eyes were depicted, probably with humorous purposes. 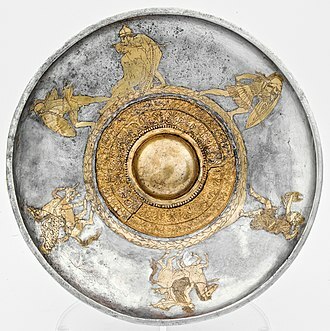 The shape of the kylix enabled the drinker to drink whilst recumbent and it enabled them to play kottabos, a game played by flinging wine lees at targets. A typical bowl held roughly 8 oz/250ml of fluid, though this varied greatly with size and shape. There are many sub-types of kylix, variously defined by their basic shape, several of these are grouped under the term of Little-Master cup. The sub-types include, After the kylikes were formed, an artisan drew a depiction of an event from Greek mythology or everyday life with a glaze on the outer surface of the formation. Inside the drinking bowl was often a portrait of dancing and/or festive drinking, unique compositional skills were necessary for the artisans to attain due to the lack of verticals and horizontals on the surface. Onesimos and Douris were famous painters in this field, individual kylixes with articles include, Arkesilas Cup, very unusual because it shows a living political figure, Arkesilaos II, king of Kyrene. 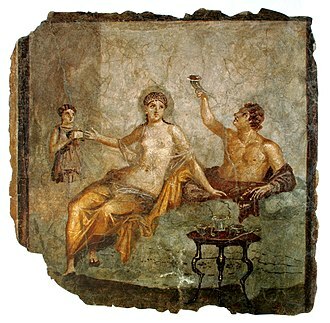 It is dated to about 565/560 BC, and is now in Paris, dionysus Cup, famous for its painting, 540–530 BC. The area took its name from the city square or dēmos of the Kerameis, which in turn derived its name from the word κέραμος. The cemetery was where the Ηiera Hodos began, along which the moved for the Eleusinian Mysteries. The quarter was located there because of the abundance of clay mud carried over by the Eridanos River, the area has undergone a number of archaeological excavations in recent years, though the excavated area covers only a small portion of the ancient dēmos. It was originally an area of marshland along the banks of the Eridanos river which was used as a cemetery as long ago as the 3rd millennium BC. It became the site of a cemetery from about 1200 BC, numerous cist graves. Houses were constructed on the drier ground to the south. During the Archaic period increasingly large and complex grave mounds and monuments were built along the bank of the Eridanos. The building of the new city wall in 478 BC, following the Persian sack of Athens in 480 BC, at the suggestion of Themistocles, all of the funerary sculptures were built into the city wall and two large city gates facing north-west were erected in the Kerameikos. The Sacred Way ran through the Sacred Gate, on the southern side, on the northern side a wide road, the Dromos, ran through the double-arched Dipylon Gate and on to the Platonic Academy a few miles away. State graves were built on side of the Dipylon Gate, for the interment of prominent personages such as notable warriors and statesmen. The construction of such lavish mausolea was banned by decree in 317 BC, the Roman occupation of Athens led to a resurgence of monument-building, although little is left of them today. During the Classical period an important public building, the Pompeion and this served a key function in the procession in honour of Athena during the Panathenaic Festival. It consisted of a courtyard surrounded by columns and banquet rooms. During the 2nd century AD, a storehouse was constructed on the site of the Pompeion, the ruins became the site of potters workshops until about 500 AD, when two parallel colonnades were built behind the city gates, overrunning the old city walls. A handle is a part of, or attachment to, an object that can be moved or used by hand. The design of type of handle involves substantial ergonomic issues. Handles for tools are an important part of their function, enabling the user to exploit the tools to maximum effect, the three nearly universal requirements of are, Sufficient strength to support the object, or to otherwise transmit the force involved in the task the handle serves. Sufficient length to permit the hand or hands gripping it to exert that force. Sufficiently small circumference to permit the hand or hands to surround it far enough to grip it as solidly as needed to exert that force. Other requirements may apply to specific handles, A sheath or coating on the handle that provides friction against the hand, designs such as recessed car-door handles, reducing the chance of accidental operation, or simply the inconvenience of snagging the handle. Sufficient circumference to distribute the force comfortably and safely over the hand, design to thwart unwanted access, for example, by children or thieves. In these cases many of the requirements may have reduced importance. For example, a child-proof doorknob can be difficult for even an adult to use, one major category of handles are pull handles, where one or more hands grip the handle or handles, and exert force to shorten the distance between the hands and their corresponding shoulders. The three criteria stated above are universal for pull handles, many pull handles are for lifting, mostly on objects to be carried. Horizontal pull handles are widespread, including drawer pulls, handles on latchless doors, the inside controls for opening car doors from inside are usually pull handles, although their function of permitting the door to be pushed open is accomplished by an internal unlatching linkage. Pull handles are a frequent host of common door handle bacteria such as e-coli, some throwing motions, as in a track-and-field hammer throw, involve pulling on a handle against centrifugal force, in the course of accelerating the thrown object by forcing it into circular motion. Many drawers use pull handles. Many doors use twist handles. Inner Kerameikos, view northwest. Sacred Gate on the left, Pompeion on the right.